Hi!I´m a teacher of English from Poland. I love working with my students and my job is my passion! I joined this site at the end of February 2010 and I´m proud I can be a member of this wonderful community. 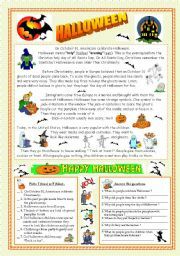 I hope you will find my worksheets useful. I´m a member of islcollective.com and you can find my ws there,too. Students have to write the adjectives in the correct places, put the words in the correct order and write correct or not correct in the sentences. I hope it´s useful. I prepared this ws for my student who couldn´t understand the order of adjectives. 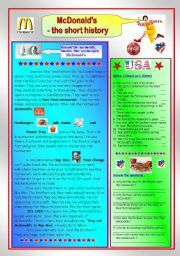 You can find here 5 exercises : matching the words with the pictures,separating the words to get popular Bonfire Night rhyme, matching the expressions, reading and answering the questions. I hope it´s useful . Hugs ! The short history about JEANS in Past Simple. After reading, the students have to write true or false and answer some questions (the key included). This is the SEVENTH part from the series THE SHORT HISTORY I have made. The next will be tomorrow about the HOT DOG . 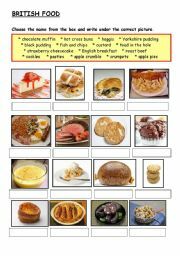 Students have to choose the name from the box and write under the correct picture.Your students can do this ws after watching the ppt about British food. You can find this ppt here among my worksheets. You can find here four exercises. First - write the words from the box under the pictures. 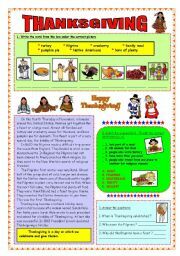 Second - read the text about Thanksgiving. Third - match the expressions with the deffinitions. Fourth - answer the questions. Have fun ! 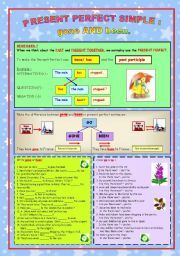 Students can see the difference between gone & been in Present Perfect Simple. In the first exercise they have to choose and write gone or been. In the second they have to circle the answer to the question about gone or been.Have a nice Saturday ! 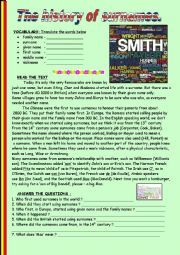 You can find here some interesting information about the history of surnames from the English speaking countries. Students have to translate some words, read the text and answer the questions. Hope you will like it. Have fun ! 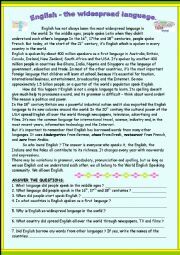 Some interesting facts about English language and why it became so widespread language in the world. Students read the text and answer the questions. Have fun ! This is the second part. After watching this ppt (it will have 10 parts) students can do the ws about London. The first part and the ws I uploaded yesterday. The fourth part and the last today, the next I will upload tomorrow. I hope your students will like it. 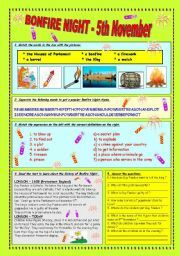 To remember the places you can use the ws about London, you can find it among my worksheets, because I uploaded it yesterday. The third part. After watching this ppt (it will have 10 parts) students can do the ws about London. 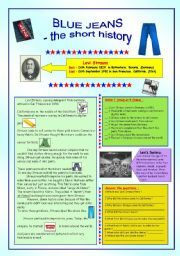 All the parts of the ppt and ws you can find here among my worksheets. The sixth part about London and famous places there.